The Northwestern Wildcats will be sporting new uniforms this fall-uniforms that aim to serve as a reminder of the legacy of the historic program. The stripe in the middle is an homage to the design so popular on athletic wear today…a design pioneered by the Northwestern Football team in 1928. While the numbers reflect the campus’s Gothic architecture. 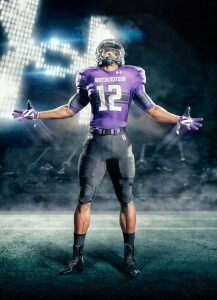 Northwestern enters the 2012 season with a goal to “Reclaim the Stripe”, as well as greater attention in the Big Ten. Read more, and see detailed photos on complex.com.